> Dogs > Obesity shortens lives: is your dog at risk? Obesity shortens lives: is your dog at risk? October is here and we are now in the run-up to the holiday season when, let’s face it with all the food temptations at this time of year, many of us find we put on a little weight. This year, why not think about maintaining diets and exercise programs prior to and throughout the holidays, so that in January our clothes still fit the way they should? If this approach appeals to you, maybe your pet could benefit too. Sadly, obesity in animals is an ever-increasing problem. According to the Association for Pet Obesity Prevention, approximately 54% of dogs in the US are classed as overweight or obese (10-15% over the ideal body weight). Interestingly, it is the most common preventable disease in dogs and avoiding it could help prevent other conditions such as arthritis, liver disease, diabetes, kidney disease, and heart failure. Specific breeds (Labrador Retrievers, Pugs, Dachshunds, English Bulldogs, Cairn Terriers, Beagles, Cocker Spaniels, Rottweilers, Golden Retrievers, Chihuahuas, Scottish Terriers, Pit Bulls, Boxers, St. Bernards, Cavalier King Charles Spaniels, and Basset Hounds) are more prone to obesity than others. If your dog is one of these breeds it’s something to keep in mind, even if she is not currently overweight. Although obesity can occur at any time, the risk increases with age, with middle age dogs being particularly susceptible. Gender can be a contributing factor, with females faring worse than males. Also, it is important to be aware that obesity can be a side effect of certain diseases such as hypothyroidism, insulinoma, and Cushing’s disease. If your pet gains weight suddenly or is overweight despite a small appetite and plenty of exercise, talk to your veterinarian. It is estimated that simply controlling weight can extend a dog’s life by two years. So, what can we do to keep our best friend alongside for longer? You should be able to feel the outline of your pet’s ribs without excess fat coverage. You should be able to see and feel your pet’s waist. When you do get the scales out, make sure you know what the ideal weight should be. The American Kennel Club gives advice on the appropriate weight range for each breed, but if in doubt check with your veterinarian. How can you help your dog lose weight? If your dog burns more calories than it consumes, it will lose weight. It may be a simple equation, but it can take a lot of discipline to achieve. It is always recommended that before embarking on a diet or exercise program to have your pet checked by a vet. If given the green light, some of these suggestions may be helpful to slim down your pooch. Just as with humans, a regular exercise program is crucial to a dog’s physical and mental wellbeing. If your pet is excessively overweight, introduce exercise slowly, increasing gradually as fitness levels and stamina improve. Aiming for at least 15 minutes of walking, twice a day is good. Although for a dog there’s nothing better than time spent sniffing a hydrant, a brisk walk, rather than a stroll, is desirable. If you can gradually increase the frequency and duration of the walks, add in some ball-play or even progress to some jogging, all the better. Human food doesn’t always work well for dogs and some is simply toxic. If possible, stick to dog food. Whether you opt for wet or dry dog food, a diet rich in dietary fiber and protein but low in fat is recommended. Protein will boost metabolism and give a feeling of fullness, while dietary fiber stimulates intestinal metabolism. 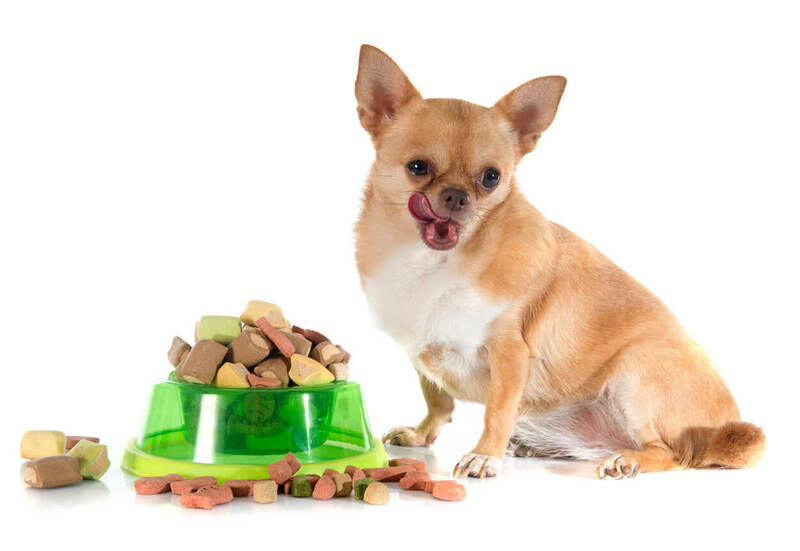 Whether you are human or canine, portion size affects weight gain. If you weigh out each meal you will keep portions to a sensible size. Try to avoid using self-feeders, but if you must use these, try an automated version to dispense a set amount at specific times of day. If your dog is still hungry after mealtime, offer fresh water. If you have several dogs, but not all are overweight, try to feed the dogs separately and do not leave food out, so you can figure out who has eaten what. Treats are typically high calorie and where possible should be limited. For example, a pig’s ear fed to a 40lb dog is the equivalent of a human drinking a 6-pack of soda. Try to reward your dog using other methods such as making a fuss of your pooch, offering a favorite toy, or playing ball. Make sure the whole household is involved in this, as it just doesn’t work if Pop keeps slipping your pooch sneaky snacks. Aim for a weight loss of approximately 3-5% of body weight loss per month (or about 1lb). Too much weight loss can be dangerous, so ensure that weight checks are done regularly and work closely with your vet to ensure that everything is safely on track. Putting on the pounds is always easier than taking them off, but sticking to some of these guidelines can be life-changing. The problems associated with obesity can be reversible, so why not work with your dog so you can both achieve a happier, healthier Holiday season and beyond? We’d love to hear of weight-loss tips that have worked for your pup; photos always appreciated! Information given in this article is not a substitute for advice from a qualified medical professional. Please consult a veterinarian for advice on weight-loss programs specific to your dog.